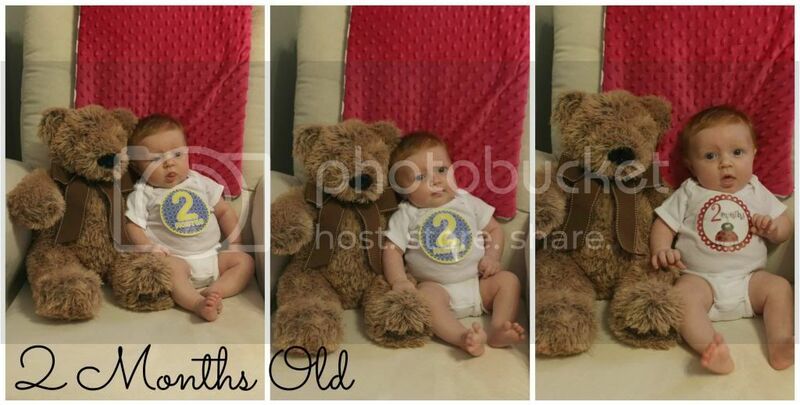 I cannot believe that 2 months have flown by! And what an amazing 2 months it has been. I love that I have only known Baby K for 2 months, but I already know so much about her. I can’t get enough of this little lady; I’m going to need her to stop growing so fast, this Mama can’t handle it. 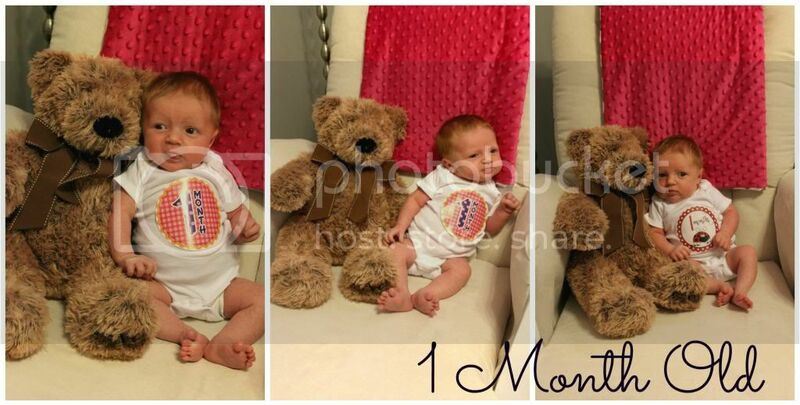 I can't believe how much she has changed in just one month! Stats: 10 pounds, 8.5 ounces (32nd percentile). 21 1/2 inches long (12th percentile). 15 1/4 head circumference (69th percentile - just like her parents with a large head!). Development: Baby K holds her head up like a champ, turns toward noise (especially mine and Tolar’s voices), has rolled over from her belly to her back, is very alert and loves to check out her surroundings, although I’m not sure she knows JoJo exists. She is full of smiles and coos and we just love it. She is thisclose to using her jumperoo, although she won’t be able to reach the ground for awhile. But she loves to stretch out her legs, kick and stand (with assistance of course!). Loves: She loves the ceiling fan! I have never seen someone be so content lying on the bed watching the ceiling fan – it doesn’t even have to be on! I am so happy she likes it because this gives me some time to get dressed while she is occupied. Baby K is also obsessed with our wall sconces – she stares at them whenever we sit on the couch. I don’t know if it’s the color contrast with the walls or if she already has an eye for home décor, but I love that she is so interested in them. Plus she loves music and will kick like crazy whenever we have something on. Sleeping: With the exception of last week while Baby K was sick, she has been sleeping really well. We put her to bed around 8 p.m., dream feed her around 11 p.m. and she is good to go until 4:30 or 5 a.m. I must admit, getting up at 4:30 a.m. is still very difficult, but I am very thankful that Baby K is already giving us some good stretches of sleep. She naps pretty well too, although her naps aren’t as frequent since she is getting older. We are using the eat, activity, sleep (The Baby Whisperer) method to help her nap better and to help her sleep better through the night – seems to be working. Also "tanking up" helps as well. Diapers: I wish I started a tally when we first brought Baby K home from the hospital, because this girl goes through some diapers!!! She just moved into Size 1 diapers over the weekend and I am so thankful because we stocked up on Size 1 so we won’t need to purchase any for awhile. Neither Tolar nor I ever imagined that we would have a 5 pound, 15 ounce baby at birth who would stay in Newborn diapers for 8 weeks. CVS has had some great sales on Newborn diapers lately which really helped out. Eating: As you can tell from the pictures, Baby K eats like a champ. She is a grunter when she eats too, which is quite funny – although at 4:30 a.m. I am sure Tolar wishes she wasn’t so vocal. Clothing: No more Newborn clothes for our girl anymore, we now have her in 0-3 months (although everything is quite large on her). It was very sad when I had to pack up her Newborn clothes last weekend, stop growing Baby K! And I am doing something I never thought I would do…I’m choosing functionality over fashion for Baby K. If we are just staying home for the day, I keep her in onesies. They are so easy to work with during the MANY diaper changes, I don’t want to have to deal with multiple outfit pieces when I’m changing her diaper 10-12 times a day. However, when we venture out in public I do dress her up a bit, I mean she IS my daughter! Most Asked Question: Where does she get her red hair, whose side of the family? Answer – we don’t really know! We just know that we LOVE it and hope it always stays that way. Tolar and I are so blessed to have a very happy baby who doesn’t really cry that often (except for that horrific trip to the Emergency Room). She is such a joy; I want to squeeze her all day. In fact, I think I need to go do that right now! I love red hair. She is so adorable! i can't believe its the two month mark! we've been trying the eat, play sleep and most times it works! :) that's great that she goes that long sleeping! is she still in your room? addilyn doesn't fit in her newborn clothes as of two weeks ago - i almost cried! she also loves the ceiling fans! Aw, she's so big already!!!! Can't wait for more pictures! I LOVE her red hair and she is SO cute!